It’s the Holiday season and there will be thousands of engagement announcements over the next few days, as well as the next week and a half. Don’t be like your friends and go with a generic proposal. Go with one that feeds her mind’s eye or, in our case, Disney minds eye. We all know about The Knot’s ten most romantic places to propose at in Disneyland but aren’t you tired of that cliché by-the-castle proposal? I sure as hell am. I may not be in a relationship and it is probably crazy for me to even make this list but I literally don’t care. I LOVE DISNEY. We’ve pulled together a fun list of 10 place in Disneyland that any true hard-core Disney freak will love and appreciate. It requires much planning, maybe much gold, and a whole lot of dedication to pull off some of these proposals but in the end, it’s a memory you’ll never want to forget. 1. Space Mountain – It’s possibly one of the most epic rides out of the two theme parks, and always has a long wait. It’s also pretty symbolic of how life is; fast, crazy, and all over the place – what better place to propose? Here’s what you do: Create a 11X14 sheet of paper or card stock and write your love a “marry me” message on the front of it. 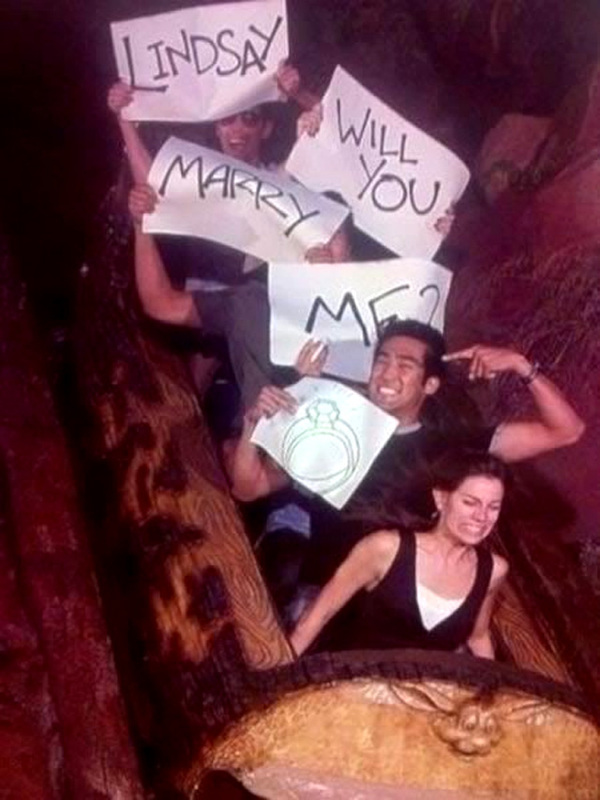 While you’re on the ride and nearing the end where your photo gets taken, whip out that proposal and hold it up high! Hide it really quickly before the light spots fade from her vision. Then have her run up to the photo booth directly after the ride and find your image. While she’s looking at the photo, get down on that knee and pull out the ring! She’ll be so excited and surprised, she’ll remember for all of time! 2. California Screamin’ – this ride is by far the fastest and most interesting ride to propose on. Not only do you have Neil Patrick Harris as the ride’s voice over, but also twists, turns, and loops! It is a ride however that you absolutely have to be quick on! Here’s what you do: Have the ring in your pocket and as you make that final turn into the photo op area pull out the ring and yell your proposal over to her and get a snap shot of her reaction! She’ll be frozen in time and everyone on the ride will be able to see how romantic and fun you are, as they all exit off the ride and down to the photo booth! 3. Mickey’s Ferris Wheel – If you’re a pure romantic and you want to capture the classicism of a ferris wheel proposal and the excitement of the Disney Theme Parks, then Mickey’s Ferris Wheel is your best bet! Here’s what you do: This ride has two options: slow and steady, or rockin’ and rollin’, choose which type you want to go on and structure your proposal around that! If you choose the rolling option, propose to her and make sure you hold her tight! *Propose at sunset for bonus points! 4. Entrance proposal – There’s nothing more exciting than walking into the entrance plaza between both parks. Whether you’re a Disney purist or a new wave California couple, starting the day off right with a big surprise will make ensure it’s an incredible day. Here’s what you do: This may require a little bit more planning so make sure to plan it in advance! Invite all her family and close friends to the theme park. Have them each hold one letter to spell out her name and “will you marry me?.” Plan to have enough people to hold two letters at the most! As an extra bonus you can bring her to the parks on her birthday and have her family surprise her at the front with “happy birthday” and once they flip it over have the letters spell out “will you marry me?” Not only does prove you’re put forth the effort for her, but her family approves of the marriage as well! *Don’t forget to have someone photographing the proposal! 5. 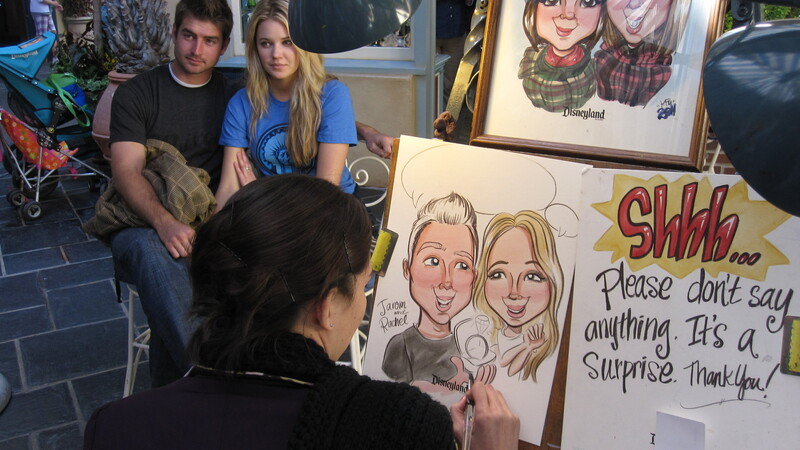 Caricature Proposal – having your portrait done is almost like getting your photo taken on one of the rides but requires a lot more patience on your behalf. Not to mention the passer-byers keeping your proposal a secret as it’s going on! Here’s what you do: Find an artist and schedule a time to come back. Have her “grab you a snack” as you set up the time with the artist. Tell the artist your plans and make sure he has a sign out that says to keep your secret while you’re being drawn! Once the image is finished you’ll have a commemorative piece of Disney art to go along with your proposal, and the fun and laughter that you’ll bring her as she realizes she waited a whole hour to be proposed to! 6. 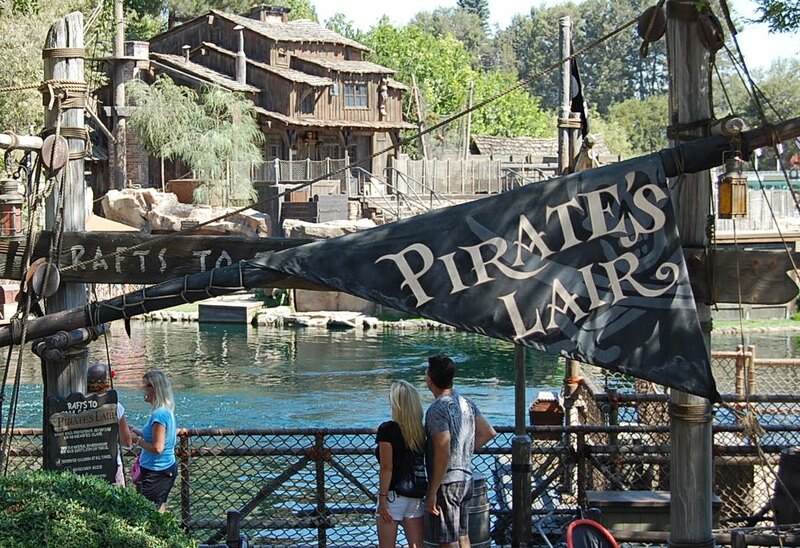 Pirate’s Lair – What used to be Tom Sawyer’s island is now Pirates Lair. This small island in the center of Disneyland brings back feelings you probably once had as a kid playing hide-and-seek on the island. Remind her of all the kid-fun you love to have with her and propose here! Here’s what you do: Journey across the island and explore it a little together and find a small cave or hiding place she can come find you at. Then instigate a game of hide-and-seek with her and give her 20 seconds to count. Run to your place of hiding, pull out the ring, and wait for her to find you! 7. Splash Mountain – This ride is pretty easy to sneak a proposal into, as the dive down the waterfall to have your photo taken is pretty obvious. The trick in this one, is getting the people you might be riding with to help you hold up the signs! Here’s what you do: Write up all the signs before you leave for the park and stash them in your pocket. While you’re waiting in line make sure she stays a step ahead of you, when she’s not looking, pass the signs to the people behind you and ask them to help you with your proposal! When you get ready to go down the waterfall have them pull out your message and hold it up high! When you walk out to see your photo she’ll be in shock! 8. 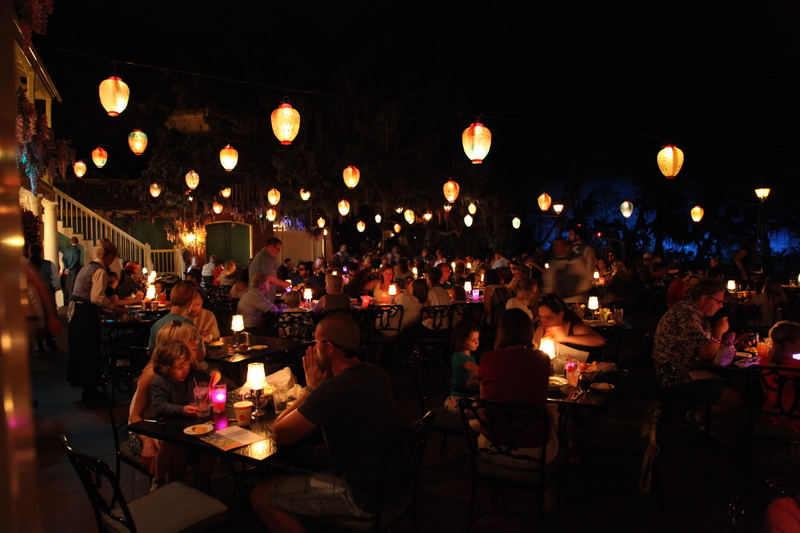 Dinner at the Blue Bayou – This one’s for the romantics in the crowd! The Blue Bayou is one of the coolest and most beautifully lit restaurants in the parks and is perfect for a romantic by-the-water dinner. Here’s what you do: As you make your reservation have the host take a note down to bring dessert out at the end with the ring in place and a message that reads “will you marry me?” written in chocolate. It’s a Disney twist on a classic dinner proposal that she’ll love for years to come. 9. 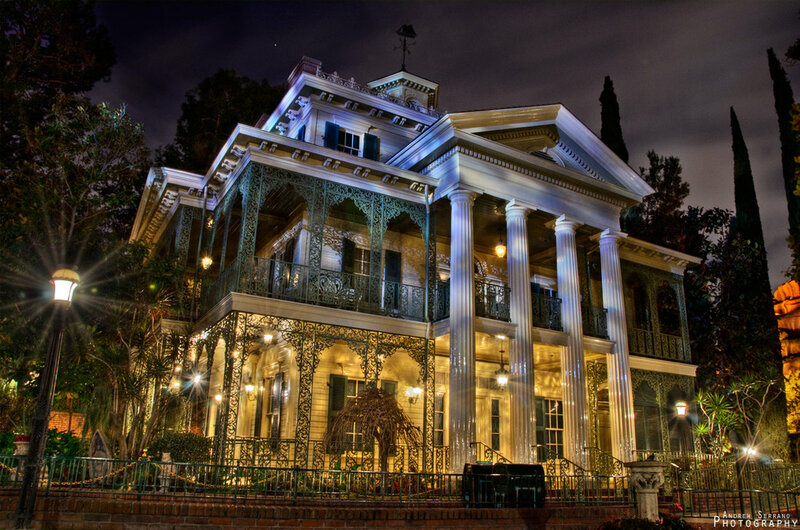 Haunted Mansion – If you’re a creepy ride fan then the Haunted Mansion just might be your match made in heaven. This ride has so many surprises and elements of “ick” that you’ll just turn that mansion stereotype around! Here’s what you do: As you enter the mansion and are piled into a room with “no doors, no windows, and now way out” have the ring in hand. The creepy narrator will begin his spiel and then lighting will strike, right at this moment get down on your knees (be careful though! The lights go out) and hold the ring in its little box up as high as you can. Once the lights come on and she’s looking around for you, pop the questions, and enjoy the rest of the Haunted Mansion! 10. Her Favorite Disney Spot – No matter how you put it there’s nothing more special than a proposal at her favorite Disney spot, even if it’s at the castle or on a roller coaster!